I have been practicing Feldenkrais with Colin for several years. I feel truly transformed by this work, both as a musician and as a person. My awareness of my body has developed enormously, helping me a lot with my piano technique. My way of working has evolved : I practice less like a student now, with more variety and with much more efficiency than I did before. I also feel more peaceful emotionally when I work. Since I’ve started practicing Feldenkrais I enjoy being on stage much more and feel the difficult aspects of performing much less. What I really appreciate about the type of work that Colin offers is the relationship between the lessons and playing one’s instrument; very powerful experiences making you question what you thought you knew. The times of sharing between the participants are very rich (and too rare in the musical world where we have the habit of working alone). All of this nourishes my teaching enormously. The lessons have also made me more curious, more observant and more flexible with respects to my habits and in all aspects of my life. I only did one full-day workshop with Colin. I had heard very little about the Feldenkrais Method so it was all a new experience for me. The theme was about the sitting position. I was particularly interested in this subject because, as a violinist who plays in an orchestra, I often wondered about what was a good seated position. Since this workshop (three years ago), I can say that I have never suffered from back pain linked to being poorly seated. Until this day I still feel good thanks to the way I became aware of different aspects of my body. Musically speaking I also became conscious of a solid and stable anchoring which helps in using the body as an extension of the resonance of the instrument itself, expanding the potential for sound in the instrument. The only reason I didn’t continue to discover new aspects of this extremely rich method was because of a lack of time. Feldenkrais gave me a much finer sense of my body as well as a much more efficient conception of how to work. It helped me to discover “parts” of my body that I was ignorant of and to experience new sensations which I’m persuaded have, in one way or another, changed my playing and my relationship to the piano. It’s a whole new state of mind. The idea of being in a continuous state of research and to try different things even if they seem strange, the idea of always experimenting. And to always look for something which is pleasurable as being the sign of having the right gesture. I was really struck by the work on performance anxiety which was taught also with an actor…. I remember the idea of playing like a rooster, like a very pretentious person, bringing out my chest and believing in myself completely, it felt to me like an extreme caricature but the other participants didn’t find it to be much of a caricature after all (I felt like I was overdoing it so much, but in the end I only came across as a pianist with confidence). In regards to the lessons themselves, I can say that almost all of them left a strong impression on me! At the start, I came to these workshops because of muscular pain. I suffered a lot from pain that I considered to be linked to the violin. In reality, as I discovered the Feldenkrais method, I understood that the questions that the method raised were much deeper than a question of “bad posture”, or “bad habits”. It’s never about “correcting” something as much as finding YOUR own movement through the fundamental principles of movement and working with the nervous system. This discovery isn’t made by “talking around a table”, as if one tried to understand the world by looking at an atlas, but by going out oneself, like an explorer in the jungle, discovering a new world – a world one thought one knew and yet remains largely unknown. After having done the Feldenkrais Method I no longer look at my body as a collection of problems, pains or things which are wrong, but as an immense open space of possibilities, almost infinite! I think that the most important benefit of Feldenkrais in my professional life was gaining much more confidence in myself. I am not really someone who lacks confidence, but like most people I can become more vulnerable in certain situations. Feldenkrais taught me to find confidence through my body and not by willing it. Becoming conscious of my breathing, doing movements which guarantee more stability from the ground up, finding flexibility in the limbs, this is what I do when I am now confronted with a difficult situation. The result is amazing! It goes against the stream of other teaching methods (in music or any other domain). The method teaches us to “have fun, find pleasure, rest when you are tired, avoid any useless effort, act like the baby in their crib!” where other methods teach on the line of “work and you will succeed and ignore effort and pain, the road will be hard and difficult.” During the workshops that I took with Colin, there wasn’t an instant when the words “difficult, boring, tiring…” came to mind. On the contrary, it was the pleasure of going out to discover one’s body, to accept it as it is, which was a source of well being for me and great overcoming of tension. The progress that I made practicing the method translated directly into the instrument. As much as I felt my muscular tensions diminish, I felt my level of playing improve. If I was hesitant at first, I was convinced by the very first workshop. I remember perfectly the sound that my violin produced was completely different the same evening after the workshop! I felt this change myself, and this change was confirmed by someone (a pianist) who hears me play every day. I don’t know any other method that allows you to measure such important results in so little time. The more I was able to enjoy what I was doing, the better I felt and the better I succeeded. I will add one last dimension regarding the workshops that I took with Colin, and it’s about my relationship with others. To understand and accept one’s body is to understand and accept the other. I think that I have developed a greater tolerance towards myself, and as a result, towards others as well. I really love the Feldenkrais Method, I find the approach both fun and very complete. In my work as a musician, it helped me find a more supple, flexible technique, based on the fundamental principles of Feldenkrais: do less if it hurts, try different possibilities in order to have more choice, invite all of your body to participate when you play, etc. These principles helped me enormously to find my sound in difficult situations like having to play without being able to warm up, or for auditions or competitions. 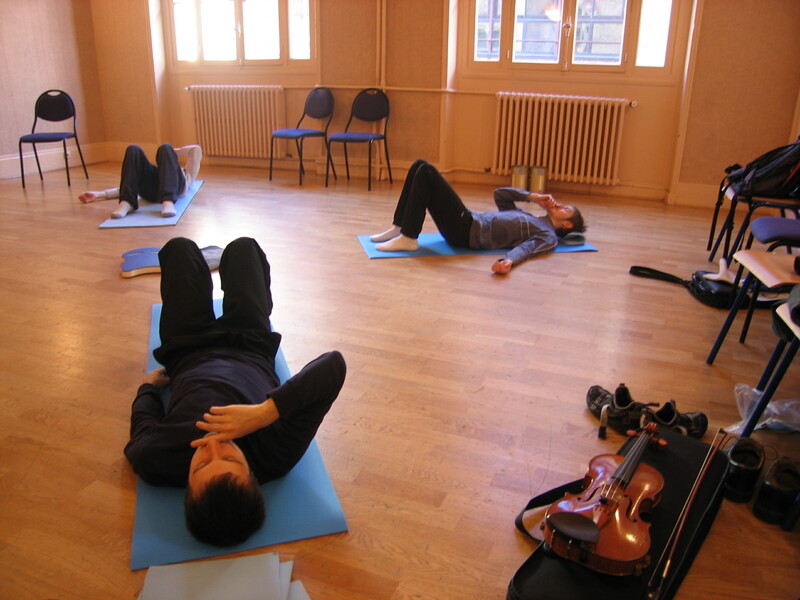 Colin has found a unique manner of teaching Feldenkrais combining his experience as a musician with his practice of the Method in order to deal with important questions that musicians face and offering answers which help each person to progress. Colin also succeeds in creating an environment where people feel safe enough to express themselves (it’s not always easy to be open to questioning oneself) and in general everyone left each workshop having learned a lot. These Feldenkrais workshops truly revolutionized my artistic and musical life: working on oneself in a group allowed me to realize that many of our fears are the same, and being able to share them helps to undo them. I gained a lot of self-confidence from the experience and also found concrete tools to help me to relax or to find my sound before an orchestra audition or a concert. All of the auditions that I succeeded in England was for the most part thanks to these workshops (London Symphony Orchestra, Opera North, Scottish Opera, Bournemouth Symphony). The most striking experience during these workshops was finishing a lesson and then picking up my instrument and having the impression that everything was so easy and simple – easy to play the violin or viola… a feeling of comfort and great control, and a huge palette of colors!